There’s always something about the new year that makes you want to start something afresh on a whole new slate. This year, this sense of starting anew is particularly strong in me, as I made my closure for the old year, and welcomed the new one with a new outlook. It was a simple reflection page for the New Year, something I thought of when I while receiving messages to enjoy the last day of the year. Four quadrants, two each for each year. For 2017, sad to see it go, glad to leave it behind. For 2018, uncertain about the future, looking forward. I wanted to reflect on the positive and negative of these two years, and I picked these four phrases because I felt like they best represent the thoughts I had for this New Year. Perhaps because the reflection was so intentional, it felt really good to be writing down my thoughts down, unfettered, all the things that I did not manage to say in my journal for the past year. To me, this exercise was really good because it really allowed me to put 2017 behind (because so much things happened and I needed to resolve my feelings about them) and to look forward to the opportunities in 2018. 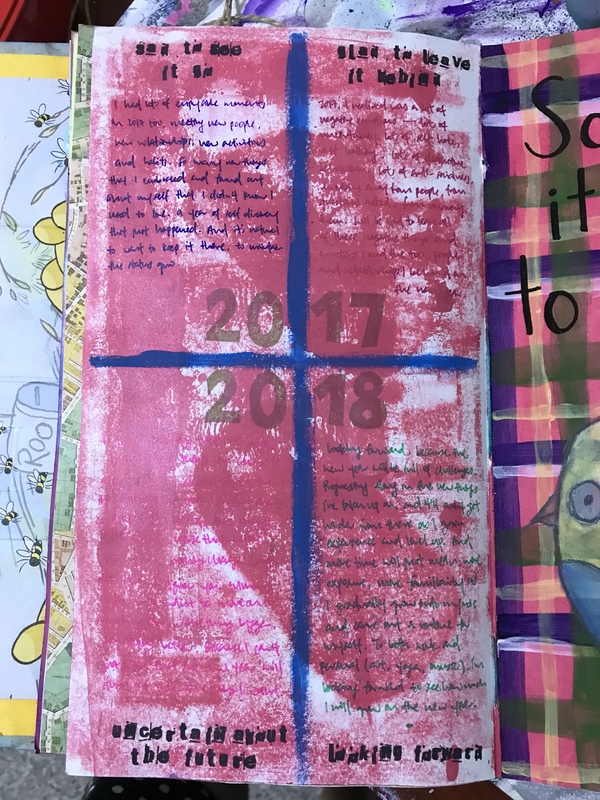 It was symbolic too, because as I finished the page, I decided that this would be the last page in this art journal, even though there was still a couple pages more that I could use if I wanted to. It just seemed like a nice way to end the year, to end this art journal which had been with me for the past two years. Don’t get me wrong, I really liked this art journal, and it’s my favourite yet, but I was so done with it, especially in the last year struggling with the negative emotions that I had. I felt like I needed to change, from being stagnant, because I have been struggling with my creative process – this is the second art journal I’ve done in the same style, so that makes it five years maybe that I have been doing it this way. I’m desperate for change, and starting the new year in a new art journal seemed the perfect way to kickstart it all and to embody the whole “start on a new slate” idea. It’s not really a new year resolution, I think, not really, but it does represent the resolve and mindset that I have going into the new year. It’ll be more clear once I get about sharing the new journal I think. Just finished making it yesterday and haven’t got around to any pictures yet. To all who are reading, hope the new year has been kind to you so far and here’s to a great year away for the both of us. I’m trying to blog more regularly again (and it seems like I’m always trying to do that). I think I’m still kinda unsure of what I want to achieve out of this blogging thing, because it keeps changing and I keep having grand ideas that I cannot keep up with, but right now, I think it’s about me putting myself out there and not being afraid to show a part of me that I had been afraid to showcase for the longest time. With any luck, here’s to more art sharing in the year ahead.